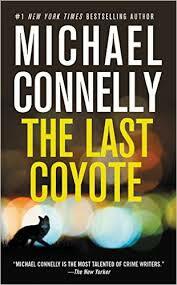 The Last Coyote is the third installment in Michael Connelly’s series of crime novels featuring LAPD homicide detective Harry Bosch. It begins with Bosch in a psychologist’s office, placed on involuntary stress leave for throwing his lieutenant, Harvey “Ninety Eight” Pounds, through an interior office window. Until Bosch deals with his issues, his “shrink” won’t recommend he be reassigned to the homicide table. Bosch’s issues begin with and center on the murder of his mother in November 1961, a crime never solved. In his spare time, he digs into the case and discovers that powerful forces in the City of Angels wanted the case to go unsolved. The more he digs, the more he uncovers, and the more he endangers himself and those around him. The pacing of The Last Coyote is a bit slower than the previous two books, which can be dangerous in a crime novel. However, in a long-running series (as the Harry Bosch novels have turned out to be), it is important to get into the lead character’s head in order to understand his personality and motivation. The Last Coyote succeeds brilliantly in this regard, giving us insight into Bosch’s cynicism, loneliness, and commitment to justice. The fact that the solution to the mystery follows a twisting path—with an especially hard turn at the end—only makes the introspection that much more interesting.